If you are a true movie lover, you not only recall movies (every intimate detail about them), but specific situations surrounding your experiences with movies. When I was in fourth grade, I sat near a girl named Susan. Her mother took her to see a lot of movies because, as she put it, "she had to learn sometime". I can remember Susan telling my classmates and I about movies like Alien and Saturday Night Fever. I also recall her describing a movie entitled The Shape of Things to Come and mentioning that the movie had children whose faces were burnt. For some reason, I have a very clear recollection of being fascinated by this. That movie faded into obscurity and I hadn't thought of it in decades until it was announced that Blue Underground would be bringing it Blu-ray Disc. I decided that I had to see those children for myself. Now I know that being dragged to see this movie made Susan the damaged child. The Shape of Things to Come is set in an unspecified future where, due to the "Robot Wars", mankind has all but abandoned Earth and moved to the Moon. As Dr. John Caball (Barry Morse) and Senator Smedley (John Ireland) debate about something called "Starstreak", a spaceship is on a collision course with the moonbase known as New Washington. Kim Smedley (Eddie Benton) and Jason Caball (Nicholas Campbell) ask the supercomputer Lomax for help, but all that they can do is slow the ship down, as it crashes throw the dome. This event is followed by a message from Omus (Jack Palance), who lives on the planet Delta 3. Omus announces that if the inhabits of the Moon want the drug which keeps them safe from radiation -- a drug which is harvested on Delta 3 -- then they must name him ruler. This spurs Kim and Jason to take off into space where they plan to confront Omus. The Shape of Things to Come is sometimes credited as "H.G. Wells' The Shape of Things to Come". For some reason, you don't hear Wells mentioned very much these days, despite his indisputable contributions to literature, specifically science fiction. With titles like The Time Machine, The Island of Dr. Moreau, and The Invisible Man, Wells should be celebrated alongside the likes of Jules Verne and H.P. Lovecraft as a writer with an enviable imagination. The Shape of Things to Come was one of Wells' later works, when he had moved into writing more about politics. The book straddles fiction, as it's more speculative fiction, as Wells describes a world which "could be" based on some of the political and social climates occurring when he wrote it in 1933. Well, it's too bad that this movie has nothing at all to do with Wells' work. They have the same title, and for some reason, the movie insists on creating a link to Wells, but that's where the connection ends. In reality, The Shape of Things to Come is a very cut-rate science-fiction movie is clearly attempting to jump on the bandwagon created by Star Wars, Battlestar Galactica, and Buck Rogers in the 25th Century. We do not get a story which predicts how the governments of the world will change. The only speculation here is that Earthlings will have to find another place to live. No, what we get instead is just spaceships and robots. The bait-and-switch would be possibly be forgivable if this wasn't such an incessantly cheap and cheesy movie. This Canadian project, from a director who spent most of his career making TV shows, really scrapes the bottom of the barrel when it comes to production values. The sets look fake, the spaceships are clearly models, the visual effects look like something from a Sid & Marty Krofft show, and the "robots" are clearly just people walking around wearing big boxes. Compared to the movies and shows that it's emulating, The Shape of Things to Come looks like a purely amateur outing, faring even worse than similar products from Roger Corman. Likewise, the script is pretty thin, as we get terms like "Robot Wars" and we see the "Starstreak", but the plot is little more than a Western set in space. So, I guess the big question here is how did The Shape of Things to Come lure known actors into the fold. Like so many other low-budget genre movies from the 70s, here we have a really questionable film which features either recognizable or respected actors. Obviously, we all know Jack Palance. Barry Morse has been on The Fugitive and Space: 1999, while John Ireland was nominated for an Oscar, and Carol Lynley had been in The Poseidon Adventure. Nicholas Campbell would go on to have a very long career, appearing in several David Cronenberg films. The real find here is Eddie Benton, who also acted under the name Anne-Marie Martin. This beauty was once married to Michael Crichton, and appeared on TV in Sledgehammer. But, despite the fact that she's easy on the eyes, she can't save a movie which, instead of doing direct-to-video, should have gone direct-to-Mystery Science Theater 3000. Blue Underground shows their true dedication to the bizarre and obscure by releasing this forgotten film. It's the kind of movie which will delight those who revel in camp. As for me, well, I finally got to see those burnt children...and it looked fake. The Shape of Things to Come made me hope that my hair looks that good in the future on Blu-ray Disc courtesy of Blue Underground. The film has been letterboxed at 1.66:1 and the Disc contains an AVC 1080p HD transfer which runs at an average of 20 Mbps. The transfer shows the kind of care to which we've become accustomed with Blue Underground releases. The image is sharp and clear, showing only mild grain in some shots and no notable defects from the source materials. The colors look good, and the image is never overly dark or bright. The movie features some undeniable soft focus, but this isn't the fault of the transfer. The level of detail is good, although the soft focus doesn't help and the depth is OK, but the movie does look flat at times. The Disc carries a DTS-HD Master Audio 5.1 track which runs at 48 kHz and an average of 3.5 Mbps. The track provides clear dialogue and sound effects. The majority of the sound come from the center and front channels However, some moments, most often when something goes past the camera, create noticeable surround sound action. The noises of the spaceship deliver mild subwoofer action. 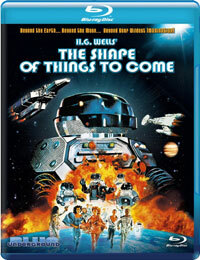 The Shape of Things to Come Blu-ray Disc contains a few extra features. "Jason's Journey" (14 minutes) is a modern-day interview with actor Nicholas Campbell, who describes his introduction to acting and how he got involved with this film. "Symphonies In Space" (17 minutes) profiles Composer Paul Hoffert who tells us about his introduction to music and composing and his approach to this project. We get the FRENCH TRAILER and one TV SPOT. The extras are rounded out by a "Poster & Still Gallery" and a "Pressbook Gallery".